Eliza Henry Jones’ P is for Pearl is a sweet piece of summer escapism. Set in a quiet beach town in Tasmania, complete with romance and hints of mystery, it’s an easy way to pass the time over the summer holidays, sitting out in the sun with a drink in hand. The reader is dropped into the life of Gwendolyn Pearson, who is just getting comfortable in her new step family. While the arrival of two new neighbors and the scent of romance pushes things forward, much of the novel is devoted to unraveling Gwen’s past while she uncovers family secrets. The mystery feels a little forced at points, with Gwen going about her life as usual until a passage of her diary appears on the page and reveals that all is not right in her world. The reader knows that something dark and tragic has happened, so it’s hard to be engaged in average teenage antics while they wait for more clues. Before all of the pieces start to fall together, the characters feel very archetypal, filling the niches Henry Jones needed for the narrative. Then the dam breaks, and we finally get to see how these characters were affected by tragedy. As Gwen struggles to accept the truth about her mother, she has some real conflict with the people around her, and the story is filled with life. 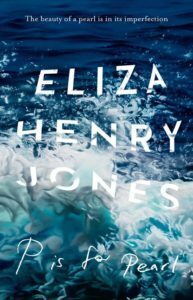 The re-assemblage of a family after a loss is a complex situation, and Henry Jones provides plenty of potential with a stepmother and brother, a new half-sibling and a withdrawn dad. Tension and reconciliation are an important part of the recovery process, and it would have been nice to see this earlier in the novel. P is for Pearl is about identity, in a subtle way. While the core focus is the mystery of Gwen’s mother, it’s also about finding herself outside of her person she shaped herself to be to please her mother. It’s a novel about grief, but also about the never-ending changes we make as people.